Editing text is done with the Text Tool. As already mentioned, clicking on existing text will select that text object and enable editing. All the normal text editing keys function as expected: Backspace, Arrows, Enter, and so forth. Cut and paste also work (see above for selecting text): Cut: Ctrl+X, Copy: Ctrl+C, and Paste: Ctrl+V. An alternative way to edit text is to use the Text tab of the Text and Font dialog (Text → Text and Font... (Shift+Ctrl+T)). Editing text in the tab may be easier, especially for long texts. Inkscape offers on-canvas spell checking. All text is checked, regardless whether or not it is selected. To spell check a document, call up the Check Spelling dialog (Text → Check Spelling... (Ctrl+Alt+K)). When a suspect word is found, it will be highlighted on the canvas by a red box. If using the Text Tool, the cursor will be placed at the start of the word. And if the Text tab of the Text and Font dialog is open, the word will underlined with a red squiggle. A list of suggested corrections will appear in the Check Spelling dialog. You can choose to Accept (if you have highlighted the correct spelling in the Suggestions: list), Ignore once, or Ignore (all other similarly spelled words in the document). You can also add the word to a dictionary by clicking the Add to dictionary: button. This will cause the spell checker to accept the word as correctly spelled permanently. You can select which language dictionary the word is added by the drop-down menu to the right. You can select which languages to use (up to three) in the Inkscape Preferences dialog in the Spellcheck section. At the moment, on Windows, only an English dictionary is included. 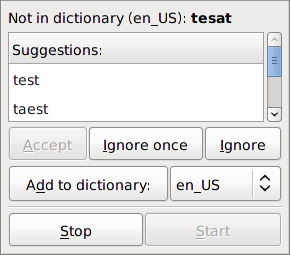 On Linux, one can install additional dictionaries by installing the Gnu Aspell package with any language packs required. If no action is taken for a period of time, the spell-checking process will time out. You can restart it by clicking the Start button. Spell checking will begin with the text at the top-right and work down the canvas.